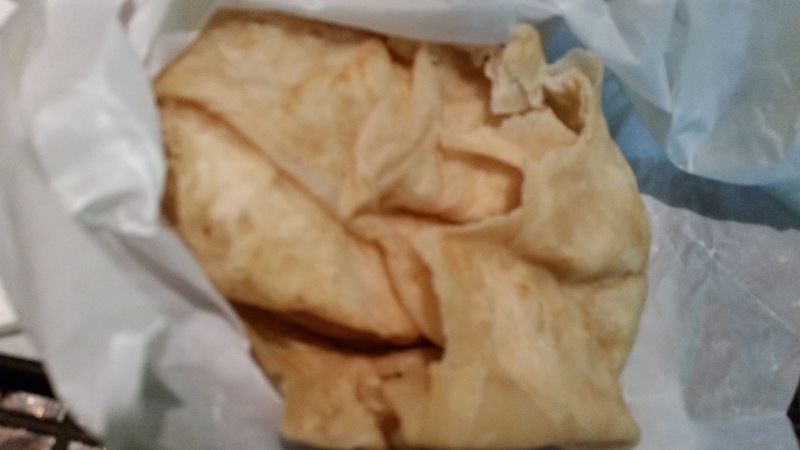 Thanks to my Trinidadian friend, Shawn, I was introduced to Trinidadian roti in Ali’s Roti Shop on Flatbush Ave in Brooklyn. It was absolutely sensational. 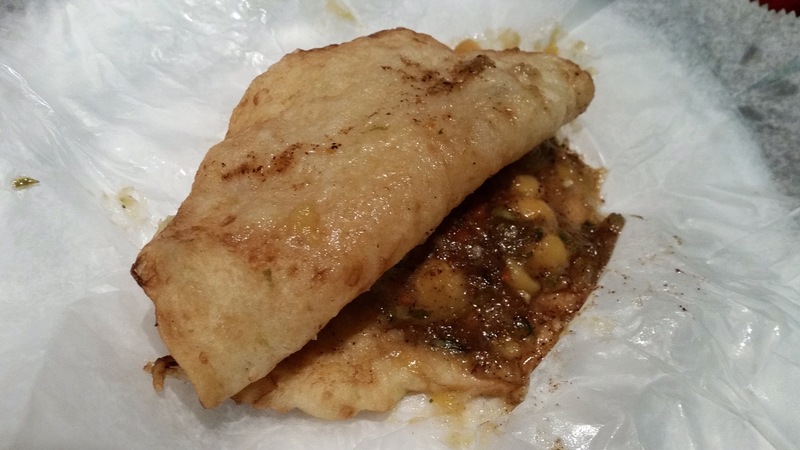 Roti, the common street food, is fulfilling and filled with yummy ghee, channa (curried chick peas) and cumin. I gained an appreciation for roti and loved the new education that came with eating it. Doubles: a sandwich made with two bara (flat fried bread) filled with channa (curried chick peas), eaten with spicy and sweet sauce. 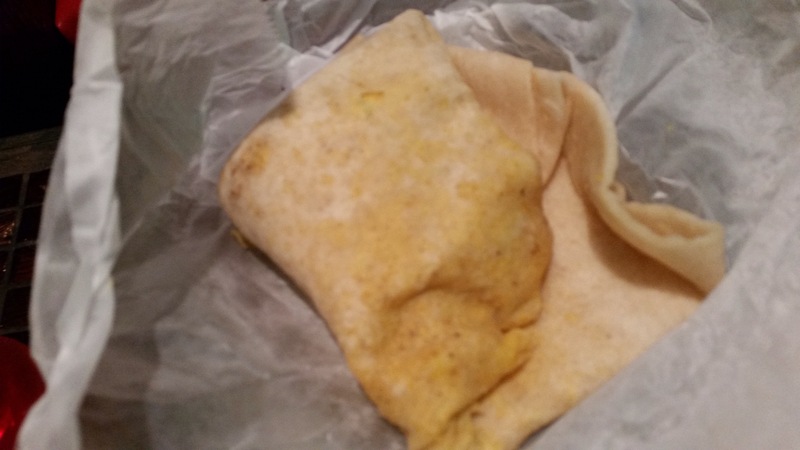 This is a food that was pioneered by a Trinidadian entrepreneur. We started with Doubles, almost like an appetizer. 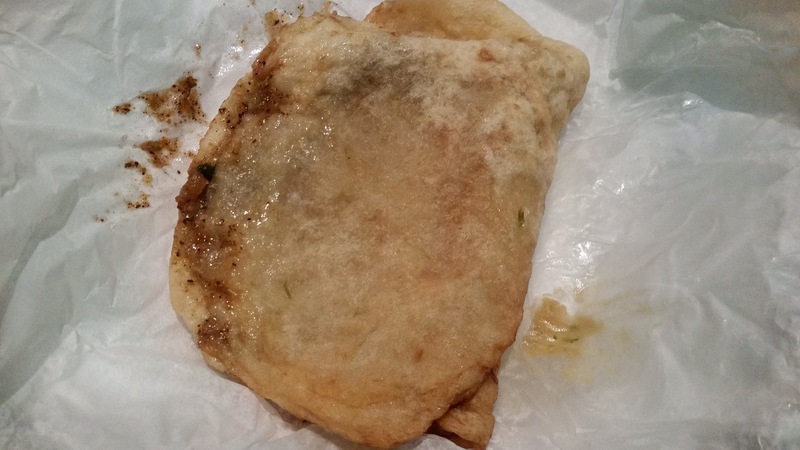 Buss Up Shut or Buss Up Shot (Busted-up Shirt): A lighter version of the Indian Paratha roti made to look like a busted-up shirt. I asked Shawn to repeat his explanations since I was surprised to learn of the colorful description. The texture was like shredded thin paper bread that is both airy and chewy. Here is another explanation of Buss up Shot by PRI. 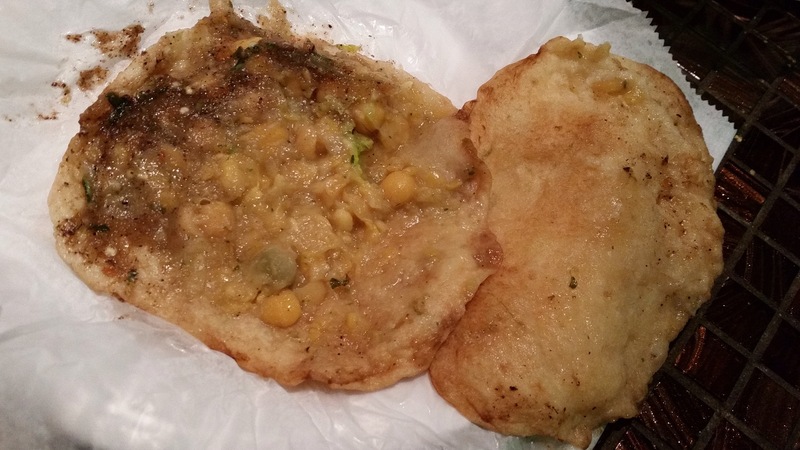 Dhalpuri: My commoner explanation of this is that it is a roti with the channa filling in a pocket and folded up to look like a regular roti. So you eat until you are surprised with the present in the middle – kind of like a toy inside of a cereal box. 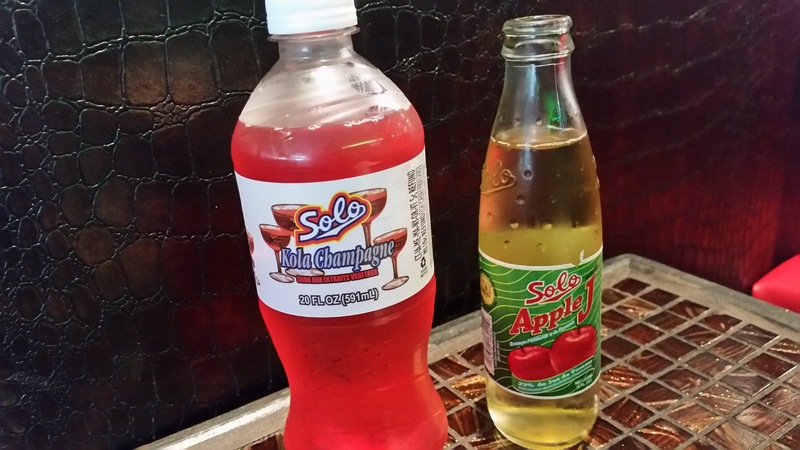 Apple Cinder and Solo Kola are the quintessential beverages to accompany our roti brunch. A Doubles when we first got it. A Doubles revealing its middle. 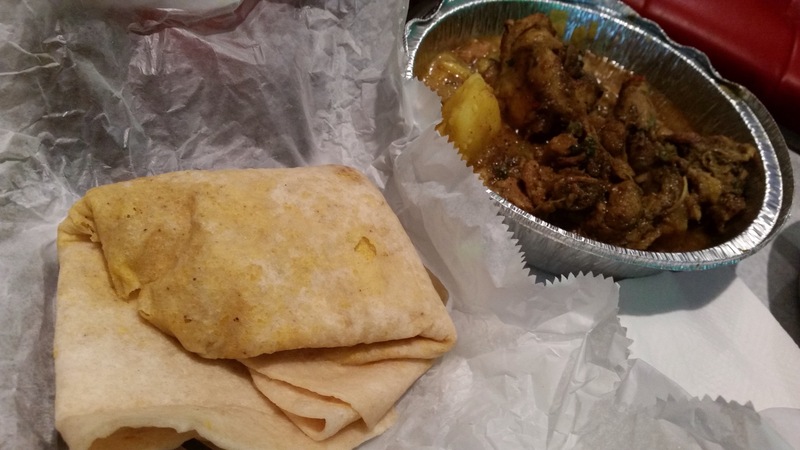 Dhalpuri with curried goat and curried chicken. 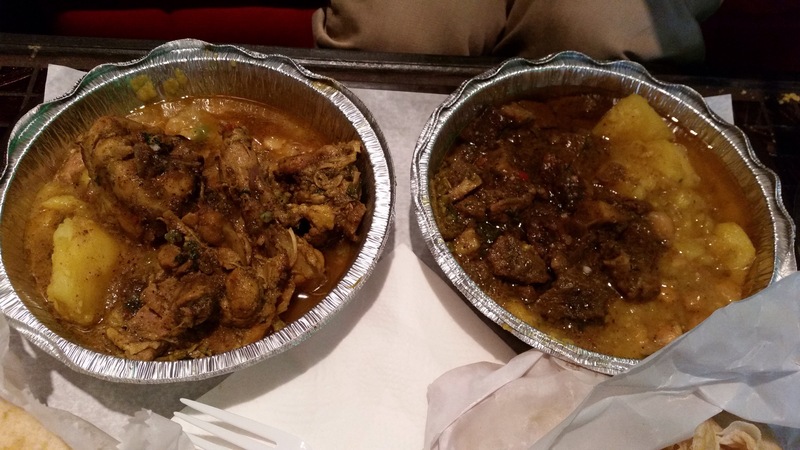 Curried goat and curried chicken. We slathered so much tamarin sauce and spicy sauce on top of these stewed and meat-falling-of-the-bone dishes, eaten with either the buss-up shut or Dhalpuri. It was unreal. It was messy but good. We were using our fingers to dig in and I felt like a child! It was a sensational treat for the mouth and the stomach. It was fulfilling. While I was eating, I kept on thinking how many miles I have to run to burn all the calories off. This is a food fit for the physically active. 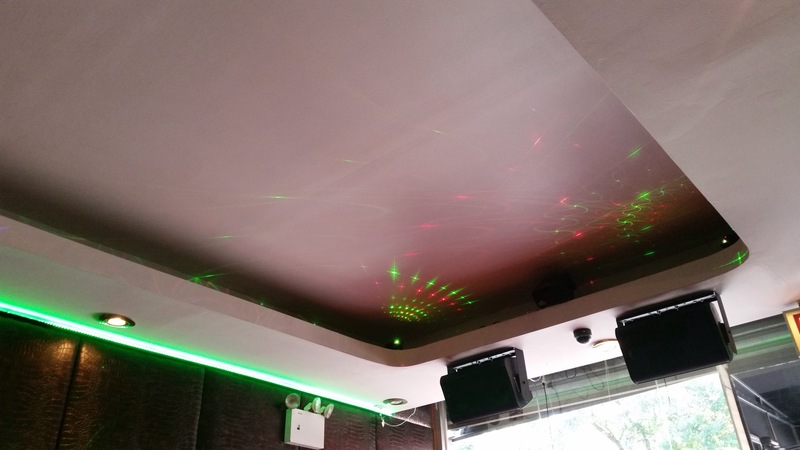 Ali’s Roti Shop is funky, with neon lights for the ceiling and walls and red leatherette booths and ottoman. Em, fyi, the lights were running during a sunny October afternoon while the owner’s young daughter (maybe 5-year-old?) was moving from ottoman to ottoman, playing with her Barbie. This is definitely Brooklyn, NY. Lastly, this is my December challenge of 4 of 17, writing a post a day until I leave for vacation, along with the Runner’s World Holiday 37-Day Challenge (running one mile a day from Thanksgiving until New Year’s.) #RWRunStreak Seems like a very tall challenge now, coming down with a cold.